Our range of barrier creams provide a defensive layer on the skin, suitable for soothing and relieving irritation caused by incontinence or skin conditions. Barrier creams are a multi-use product, and other applications include an extra barrier for frequent users of gloves and relief from dryness when constantly washing hands. 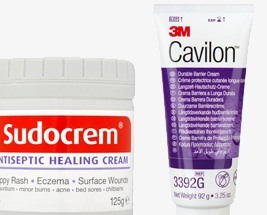 Ranging from barrier creams, foams and zinc ointments, we offer a superb range of brands and products to suit your requirements.